Zhao Zhong had lost his grip on hope of rescue. At 19,000 feet on a Tibetan mountain, 80 feet down the crevice that had swallowed him, he was perched on a thin ridge of ice. Zhao Zhong plans to bring back to his homeland ideas of how to do more local environmental improvements. Desperate to leave something to the world, Zhong took his mountaineering ax and carved his name in the ice. But after his eventual rescue, he committed himself to improving the environment in his native China. Eight years later, Zhong — now internationally recognized as a hero for his environmental work in China — is among the 12 Hubert H. Humphrey Fellows who have come from as many countries to UC Davis to further develop their academic knowledge, leadership skills and professional collaborations for public service. "I'm most proud that we're working on the environment locally," Zhong says, "and from the fellowship, we can bring back more to do more." As a class, the fellows have already made marks on the world — from improving the lives of the impoverished and the marginalized in their countries to helping address some of the world's most pressing problems. Since his university days teaching schoolchildren in a remote Georgian village, Kakhaber Bakhtadze has had a heart for his country's people impoverished by the pillaging of natural resources. A geographer, he has led more than 40 projects and programs for natural resources management and socio-economic planning and development. 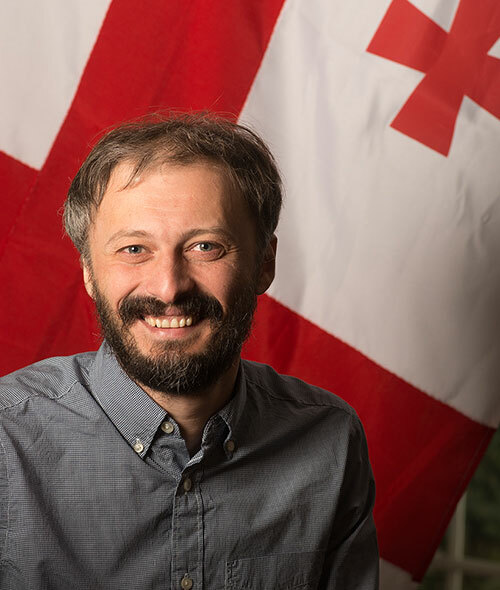 Bakhtadze headed the development of the Atlas of Natural Hazards and Risks of Georgia and contributed to the national forest policy. At UC Davis, he is teaming up with students in the D-Lab — courses in which student teams work with international partners to address energy, agriculture, health and environmental issues — to develop models for more sustainable agriculture and to improve farmers' incomes. He hopes the work can also help farmers get less expensive loans and insurance for their crops. Bakhtadze, who spent a month at UC Davis in 2011 while working on a project with the U.S. Forest Service, said he was intent on spending his fellowship at the world's leading university in agriculture and forestry. "I knew what I could expect from this university," he said. Former U.S. President Jimmy Carter established the fellowship program in 1978 to honor the late senator and vice president Hubert H. Humphrey, a long-time advocate of international cooperation and understanding. Sponsored by the U.S. Department of State, the exchange program brings young and midcareer professionals from around the world to the United States for one year of nondegree study and professional experience to help further their public service in their countries. UC Davis welcomed 250 fellows from 93 countries over 26 years. It is among 15 universities this year to host 167 fellows from 90 countries. Additionally, UC Davis Extension's Center for International Education has provided some 400 fellows with summer orientation and training for more than two decades. In 2015, UC Davis helped 33 fellows from 20 countries improve their English skills and adjust to living in the United States before going to their host universities to continue the program. Recent alumni of the fellowship program at UC Davis are making an impact around the world. One of last year’s cohort negotiated for Papa New Guinea at the recent United Nations Conference on Climate Change in Paris. Another from the same group works for Save the Children and is leading a major program to address food insecurity and vulnerability in Niger. A fellow from 2013-14 is helping artisanal diamond miners in Congo with their land rights. At Davis, fellows focus on agricultural and economic development, environmental science, climate change and renewable energy. In addition to China, the current cohort comes from Argentina, Bolivia, Cambodia, Chile, Colombia, Ecuador, Georgia, Madagascar, Nepal, Pakistan and Sudan. The fellows pursue individualized coursework and research, and participate in leadership training. They also travel throughout United States to public and private agencies and conferences related to their professional interests. For Tania Guzmán, the Humphrey fellowship is about helping to change the lives of her fellow Colombians. A lawyer, university lecturer and rural development consultant, she wants to help end the inequities and violence suffered by rural people. With a career in United Nations development work, she coordinated the team that wrote the 2011 National Human Development Report for Colombia about the entangled problems of land ownership, rural inequalities and civil war. "Even now, it's one of the most referenced reports," she said. Through her fellowship, Guzmán is exploring academic research in international programs as well as small farming cooperatives for the hope they can offer. She's already been intrigued by the work of Professor Michael Carter of Agricultural and Resource Economics in land tenure and land reform. "This is one of the most difficult problems of the situation in Colombia," she said. Zhong is doubling down on his commitment to environmental work accomplished after his rescue. A nuclear scientist then, he devoted himself full time to the grassroots organization he had founded three years earlier. This fall, he’s auditing the course "Ecology, Nature and Society" and identifying a grassroots organization to further his professional experience in the New Year. Zhong has already volunteered at the Student Farm, and he is exploring how students at UC Davis and Chinese universities can partner on sustainable energy projects. "The most important thing is to do something locally," he says, "to know how real life happens and how things can help the farmers." For more information about the program or to invite a Humphrey fellow to speak to your class or group, email Nikki Grey Rutamu. Even as he is using the fellowship to further his cause, Zhong's heart is with his people and work in China. "Here life is very comfortable," he says. "There, they are still suffering." Read about all the fellows.